Spring is in full swing, which means it is time to get ready for summer! The Sox have started their season and the fireworks are back! 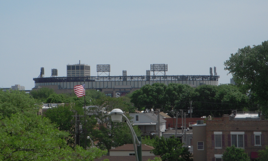 Lexington Square 2 is located just 8 blocks from U.S. Cellular Field and has amazing views of the field and fireworks from our roof decks. And if that isn’t enough fun, Donovan Park is located directly across the street. Part of the Chicago Park District, Donovan Playground Park offers different programs throughout the year for all ages. Most days you will find people playing baseball/softball, and you may occasionally catch a flag football game. Spring programs run through the week of June 3rd, however online summer registration begins Tuesday, April 16th at 9 am, and in person registration begins Monday, April 22nd. Most of the summer programs run from June 17th through the week of August 19th, and the 6-week summer camp program runs July 1 through August 9th. The park features baseball fields, a playground, basketball courts, an athletic field, and a field house. There is an interactive water spray feature to cool off with during the hot summer days. Even Lexington Place, our single family homes, are located only one block from the park. Lexington Place is still close enough to join in on all the fun! We love seeing our community enjoy Donovan Park.